The house is still standing on their little disks and swinging around the backyard, hoping to old on the longest to win HOH. "Twitter Trolls" run in out of nowhere to harass and gently smack around the houseguest with paddles. The spinning is enough to make Michelle hurl and then cry a lot about said hurling. It's basically a big brofest to hold on the longest so their new alliance, The Executives, can pick off the women. Victor and Natalie are the last two hanging, so eventually she strikes a deal for her safety and falls off. Victor is the new HOH which makes another week of Paulie puppeting the house. Paulie's extremely obvious throwing of the HOH competition right after Zakiyah fell sets her off, feeling betrayed by her flirtmance, but again buys what Paulie is selling her - or like 90%. 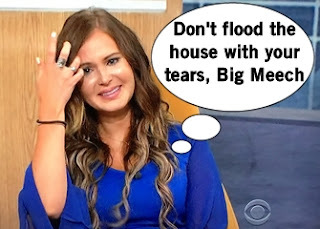 Michelle AKA Big Meech can't stop crying and being pissed about the Da'vonne blindside, lashing out at Nicole and James for keeping her in the daszrk. James gets even more air time when he wins the latest America's Care Package, which gives him the power to remove two people from voting in this week's eviction - a pretty big power that he'll likely waste. Despite being warned by Da'vonne that the house planned to target him at the double eviction, Victor blissfully follows the Pauls desires. Paulie's relieved that someone else can do the dirty work of getting Zakiyah out for him. 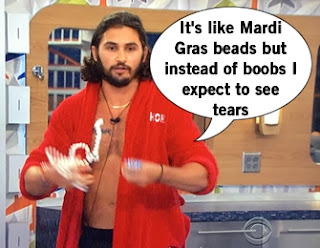 The nominations are easy and obvious, so Victor decides to be a disrespectful trashbag in the process of nominating Zakiyah and Michelle by insulting them and throwing beads at them. Michelle uncontrollably sobs after being nominated, whereas the guys are laughing and high fiving. Paul thinks Michelle's emotional outbursts are a reason to keep her around because shes' weak. 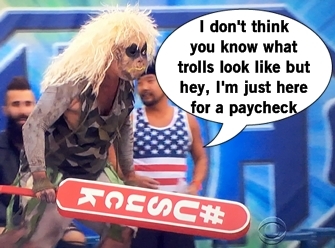 Paulie, on the other hand, thinks it's a reaction to boot her (and because she's the only one seeing through his BS). Paulie begins to work his puppet master ways to try and keep his girl in the house, trying to persuade James to use his power to cancel votes to assure Michelle goes home. In another step towards his masterplan, Paulie wins the house-wrecking Hide & Go Veto competition which means he can protect his beloved number/showmance Zakiyah by taking her off the block... except he doesn't. Paulie leaves the nominations the same and leaves it up to the house to decide whether to follow his commands. Right before eviction night, Bridgette and Natalie decide they want to save Michelle. All they have to do is show the house what they're obliviously overlooking: Paulie is running the house and making moves that help him. Michelle talks to James and encourages him to use his vote removal power to make a big move. At the eviction, James removes Corey and Paul from voting and the house takes the first step forward in their independence from Paulie and evicts Zakiyah. But the night isn't over: it's Double Eviction time! And in true Big Brother fashion, it lands with a spectacular thud. Corey wins HOH and allows the bros to run his whole night, nominating Bridgette and Michelle for eviction. Corey also wins the infamous Clown Shoe veto (it's clocks this season) so he has all the power and keeps his nominations the same. Michelle changes outfits multiple times, completely calls out Nicole as a rat, then openly sobs when it's not her but Bridgette that is evicted from the Big Brother house. Well at least we got some Big Meech sobs in for what was a depressing ending to the fun momentum of ruining Paulie.